Yesterday, Google held their big Chrome event, and apart from showing off how staggeringly fast Chrome is, a more interesting announcement was the new Chrome Web Store - including web apps from NPR, New York Times, USA Today, Sports Illustrated, Salon and others. The web app look similar what you get in native apps, with offline reading, stunning images, videos, slideshows, audio etc. Google even showed off a really impressive display of 3D, using hardware accelerated WebGL. 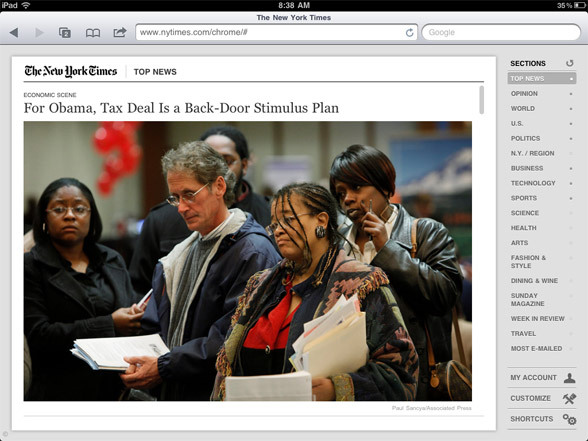 A web app that very closely mimics the look of the New York Times for the iPad or the Times Reader. You have all the normal sections, and you can customize the look. It even works on the iPad using touch gestures. 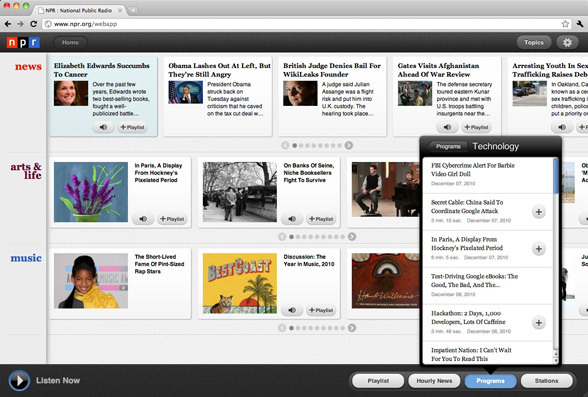 It is a very impressive podcast and article browser. You can add shows to your playlist and listen to them while you continue to browse the app. And it works on the iPad, both in the browser and as a web app. 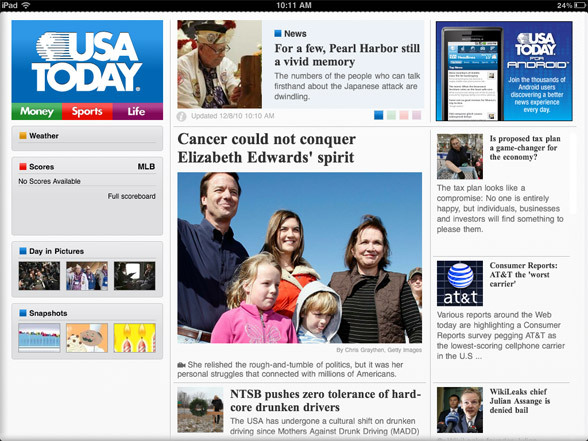 In fact, it is completely identical to the native iPad app. Showcasing the same things as you will usually see from SI. Huge images, scores, special etc. Nicely designed in the traditional SI look and feel. 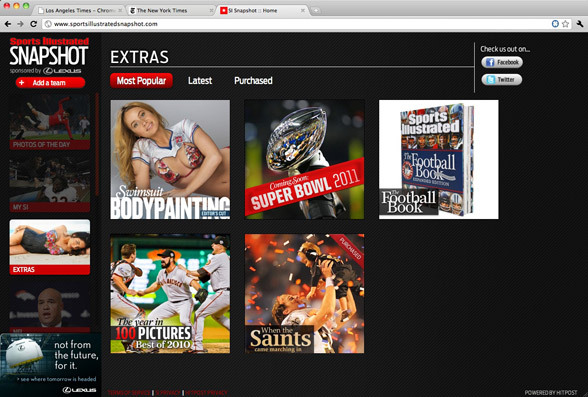 And, it is tied into Google Checkout for subscription or premium content. Nice looking app that works exactly like the native iPad app. It's the same look, the same navigation, and the same interaction. You almost cannot tell the two apart. It doesn't actually work on the iPad, but that is easily fixed. Why bother with native apps? None of the above is perfect. They have a kind of "technology showcase" feel to them. But, when you compare the result to the iPad apps, you have to ask why not just use HTML5? 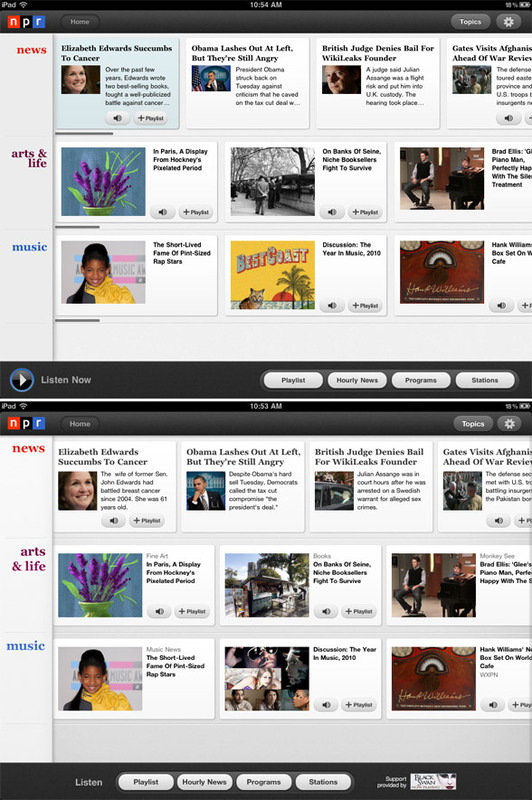 Here is a comparison of NPR's native iPad app, and the one made using HTML5 (both running on the iPad). Try to identify which one is which? One of them is limited to just one device, has to be approved by Apple with every update, and if monetized would lose a 30% cut of the revenue. 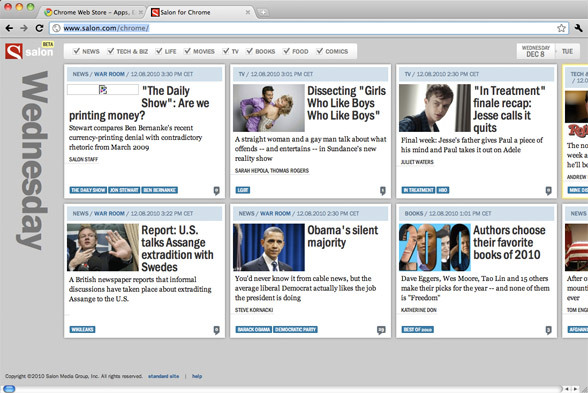 The other one is a web app that works across devices, on your laptop, netbook, iPad, and Android tablets. It is instantly updated. As publisher you have full control over the experience, and the people using it. And you get a 100% cut of the revenue. Since it is a web app, It is very easy to integrate with social service, share content, and generally be a part of the connected world (although NPR has yet to implement this). So let me ask you again, which one is which? Your readers cannot tell the difference, so why create apps that limit, instead of apps that enables? 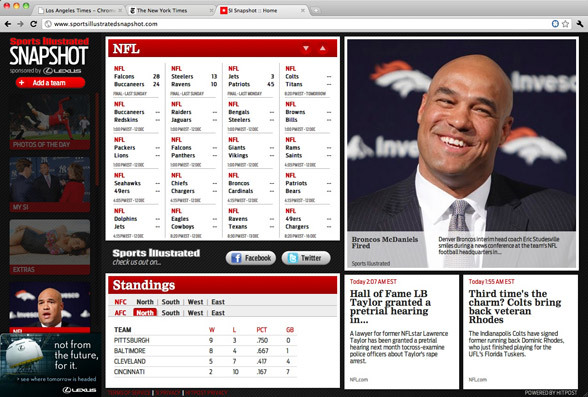 The battle between native vs. HTML5 is going intensify a lot in 2011. As you can already see, there isn't much difference between them. Especially not for the media industry. I have long decided not create a native iPad app for baekdal.com, opting instead to create a web app. But, when I started creating it back in March, I realized that I didn't even need a web app. A website, coupled with integration to RSS readers, Flipboard etc provided me with the same result. For native apps to make sense, you need to have a pretty specific use-case in mind. Just trying to make newspapers look fancy won't cut it. You can do that in HTML5. On the other hand, HTML5 is also not the right tool for the job. The entire thing is designed to handle web pages, not web apps. Meaning that every HTML5 web app out there is one big workaround, trying to get around limitations of HTML. The web app world seriously needs AML (Application Markup Language), not HTML5. We need a language that is designed to render as an app that can handle interface templates, asynchronous loading, threading etc. 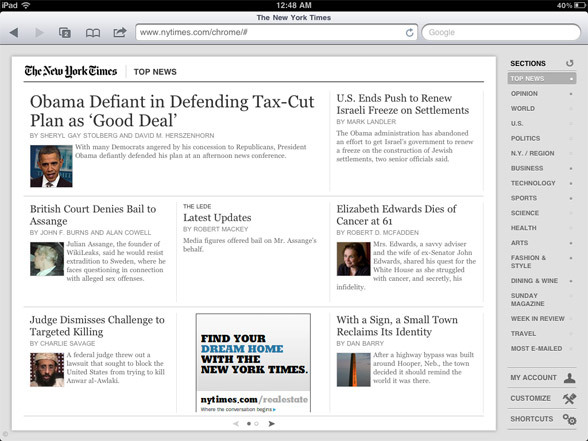 The browser on the iPad also needs much better support for app like interaction - e.g. the main reason why several of the above web apps doesn't work on the iPad is simply that the browser doesn't handle touch events natively. The result is added complexity, workarounds, and thus slower performance. As I tweeted earlier today: "Google, I'm really impressed with your web store, now please go and make Chrome for the iPad."